Open Window Theatre will close out its third season with “Lilies of the Field,” the stage adaptation of the novel by William E. Barrett and Oscar-nominated 1963 movie. Those who have seen the movie are in for a pleasant surprise. The play, which opens April 25, will feature more music than other adaptations. “[The music] enhances it and also gives that atmosphere and flavor of the time,” said director Joy Donley. There are some Catholic hymns and other hymns, spirituals, folk songs and a bit of Mexican folk music, too. “What I wanted to do was give it a little bit more of almost a cinematic feel to it,” Donley said. A folksinger, played by Christopher Erickson, sings a short folk song at the beginning of each of the play’s three acts. 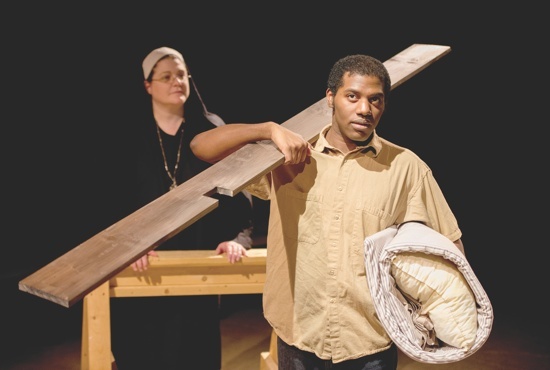 The story — about a traveling handyman in the mid-1950s who becomes the answer to the prayers of a group of nuns who want to build a chapel in the desert — fits well with the theatre’s mission, Stanbary said. It is a faith-based, inspirational and family-friendly story. Homer Smith, the handyman played by Lamar Jefferson, comes upon the nuns working in a field and offers his help for a day’s hire. The sisters believe he has been sent by God to build them a chapel in answer to their prayers, and they convince him to stay and build it even though they have no money or supplies. The story itself is interesting and compelling, even for non-religious; the success of the film has shown that, Stanbary said. The story deals with racial and religious prejudice in an indirect way by showing the humanity and the richness of the individuals and how they were able to forge friendships in the midst of their differences, he said. “Their faith is shaken throughout a little bit, but what they accomplish in the end is remarkable,” he said. Donley, who has directed three previous Open Window productions, including “Shadowlands,” one of the theater’s most successful shows, says it’s not just about the relationships between Homer, a black Southern Baptist man, and the nuns. It is also the relationships with the people in the community. They see what happens with him and the nuns and are a little skeptical about the nuns’ insistence that God will provide. “It’s a neat story because it isn’t heavy handed in the religious component, yet you watch the story and it is undeniable to see God’s hand at work in the lives of these people and the lives of these nuns and what is going on,” Stanbary said. available at openwindowtheatre.org or by calling (800) 838-3006. Doors open 40 minutes prior to each performance. « Is Communion complete with just the host? What is ‘buying a Mass’?